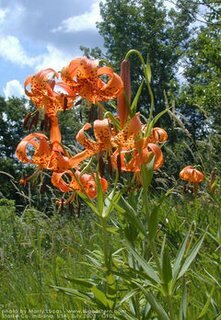 The plants of the genus Lilium are the true lily plants, comprising a genus of about 100 species in the lily family, Liliaceae. They are important as showy and large flowered garden plants, and in literature. Lilies are native to the northern temperate regions. Their range in the Old World extends across much of Europe, the north Mediterranean, across most of Asia to Japan, south to the Nilgiri mountains in India, and south to the Philippines. In the New World they extend from southern Canada through much of the United States. A few species formerly included within this genus have now been placed in other genera. These include Cardiocrinum and Nomocharis. They are commonly adapted to either woodland habitats, often montane, or sometimes to grassland habitats. A few can survive in marshland and a single one is known to live as an epiphyte (L. arboricola). In general they prefer moderately acidic or lime-free soils. Lilies are usually erect leafy stemmed herbs. The majority of species form naked or tunic-less scaly underground bulbs from which they overwinter. In some North American species the base of the bulb develops into rhizomes, on which numerous small bulbs are found. Some species develop stolons. A few species form bulbs at or near the soil surface . Many species form stem-roots. With these, the bulb grows naturally at some depth in the soil, and each year the new stem puts out adventitious roots above the bulb as it emerges from the soil. These roots are in addition to the basal roots that develop at the base of the bulb. The large flowers have three petals along with three petal-like sepals, often fragrant, and come in a range of colours ranging through whites, yellows, oranges, pinks, reds, purples, bronze and even nearly black. Markings include spots, brush strokes and picotees. The plants are summer flowering. Most species are deciduous, but Lilium candidum bears a basal rosette of leaves for much of the year. Flowers are formed at the top of a single erect stem, with leaves being borne at intervals up the stem.